Ala Kahakai National Historic Trail is a 175-mile (282 km) long trail located on the island of Hawaii. It is not yet a continuous "trail", but can be accessed at several broken segments along the coastline of the Big Island. The trail was established to access the traditional Ancient Hawaiian culture along with the natural geology of the island. The trail was established 14 November 2000 as a National Historic Trail which is managed under the National Park Service. The trail has received funds from the Land and Water Conservation Fund. 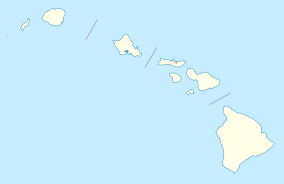 Ala kaha kai means "shoreline trail" in the Hawaiian Language. The trail follows the coastline over ancient fishermen's trails through over 200 ahupuaʻa, the traditional sea to mountain land divisions. In ancient times travel would often cover both land, and sea in canoes for portions of the journey. It passes through both public and private lands, providing access to numerous beaches and resorts. Much of the trail receives only limited maintenance and sections have been eroded or developed into roads. Only the one section of the trail has signage. A part of the trail called Ala Loa (meaning "long trail" in the Hawaiian Language, another name for the same network of trails) was added to the state registry of historic places as site 10-10-11,334 on January 14, 1989, and to the National Register of Historic Places as number 87001127 in 1987. This runs from Kiholo Bay to Kalahuipauaʻa near Puakō. After passing through the west side of island, the trail ends in Hawaii Volcanoes National Park. Starting in 2002, a comprehensive management plan and environmental impact statement were prepared and published in 2008.